Home »General Life»Is HD Video crashing your Windows Media Player? Is HD Video crashing your Windows Media Player? This was driving me crazy! 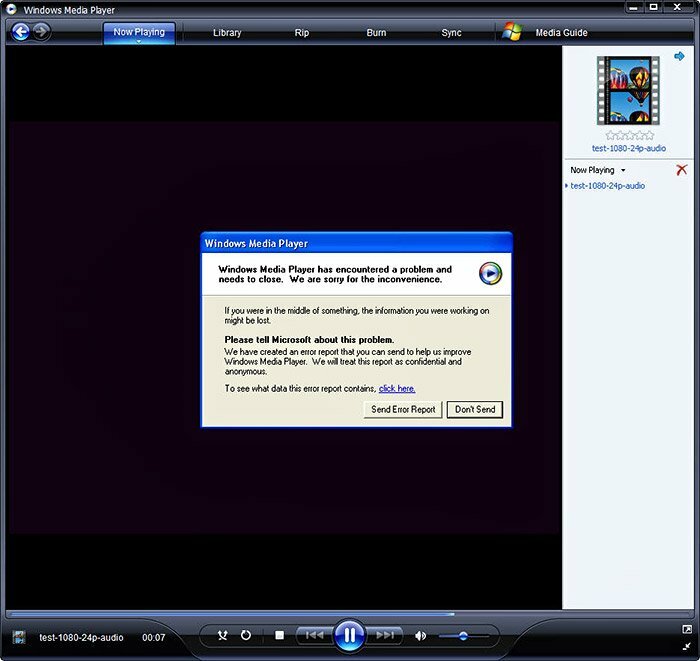 The HD videos which were created in Pinnacle Studio HD were crashing Windows Media Player. I could preview the videos in Studio HD and even YouTube, but the created Mpeg-2 files would just start playing and then generate the above error message. I tried updating my video drivers and my audio drivers, but nothing helped. At first, it was only ones created with imported audio. Soon, it was all of them. I tried a series of tests to isolate whether the bug was in Studio HD, the audio files or somewhere else. It turned out, somewhere else was the culprit. It was a file called NeResize.ax which is part of the Nero Suite! After Googling the file name, I discovered that I was not alone. This file is causing lots of problems. Nero has no information about this file on its website. In fact, there is very little support information posted on their website. No wonder people get so annoyed at them. I ran a File Search for NeResize.ax and located the problem file. I renamed the file NeResize1.ax. I added a TXT file documenting the problem and the reason for renaming the file. That’s it! Windows Media Player now plays all of my HD videos without a problem. I still use Nero for creating DVD back-ups. It seems to work fine, but I have that TXT file to remind me if there is a future problem.